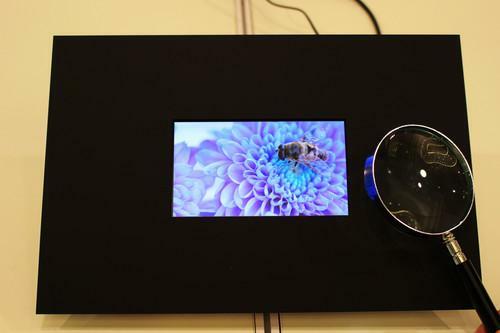 Sharp recently showed off a prototype 5.5-inch display with 4K resolution that could be used in smartphones. Sharp hasn't decided on a schedule for mass production yet. "Currently there are no driver ICs for small 4K panels, so the panel is not ready for mass production at this point," Sharp spokeswoman Miyuki Nakayama said via email. The company wants to develop and mass-produce 4K screens for clients' phones but it's too early to say whether they will be used in Sharp's own Aquos line of smartphones, she added. By comparison, Apple's iPhone 6 Plus has a 5.5-inch screen with 1920 x 1080 pixel resolution and a density of 401 ppi. Sharp regularly exhibits cutting-edge display technology, and first brought its high-definition IGZO displays to smartphones in 2013, introducing pixels that were smaller than those in conventional LCD screens. IGZO is named for the indium gallium zinc oxide semiconductor technology developed by Sharp. The company, however, has been trying to reform its struggling LCD business amid fierce competition from rival manufacturers in China and South Korea. It is expected to announce the results of a review of its medium-term management plan next month. Japanese news media reported last week that the company is considering spinning off its small and mid-size LCD panels, used in smartphones and other mobile devices.